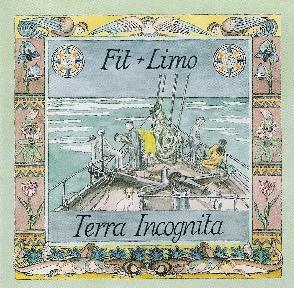 Fit & Limo - "Terra Incognita"
Fit & Limo are a husband & wife team from Germany who play some of the most singularly beautiful psychedelic folk music I've ever heard. Terra Incognita is their fourth and latest album, which they recorded along with guests Miriam Goldberg & Jeffrey Alexander of Black Forest/Black Sea and Timothy Renner of Stone Breath. Just check out some of the instrumentation on this album… electric & acoustic guitars, bass, percussion, organ, harmonium, synthesizers, sitar, marimba, glockenspiel, mellotron, cello, Indian banjo, autoharp, gopichand and chamberlain. I was unfamiliar with the latter two but a quick Google revealed the gopichand to be a Bengali folk instrument, and the Chamberlin, interestingly, to have been the original US keyboard instrument from which the Mellotron was copied, designed by Harry Chamberlin in the USA during the 1960's. Among the highlights of the set are "Will You", a folk based psychedelic song with lilting sitar melodies, flowing acoustic instrumentation and mellotron backdrops that make for a beautiful blend of 60's psychedelia and lush symphonic progressive orchestrations. "Lasst Uns Auf Die Reise Gehn" is a collaboration with Bernd Witthüser, who was half of the 70's folk duo Witthüser Westrup. I've never heard of them but this is a remake of one of their songs and it's an outstanding Dylan-esque slab of dreamy psychedelic folk music. "Golden Floor" is one of the most purely cosmic experiences of the set, featuring classic tripped out Indian flavored psychedelia, with acoustic guitar drones, flute like organ notes, darkly orchestral mellotron and chanting vocals that made me feel like I was floating along in a hallucinatory state. Another standout track is "The Weaving Song", penned by Timothy Renner and featuring vocals and banjo by Renner. How often do you get to hear banjo and sitar in the same song? The banjo and vocals create a traditional feel while the guitar and sitar trip out in space. A beautiful melding of contrasts. And "In Den Gärten Salomos" is the albums stretched out 9 minute acoustic duo in space, free-improv jamming with the aliens dream sequence track. Wow, I could go on but in short, this is hands down the most seductively, psychedelically captivating albums I've heard yet this year. If you enjoy folk-psych of the most cosmic sort, then you will absolutely love this album. For more information you can visit the September Gurls Records web site at: http://www.septembergurlsrecords.com.